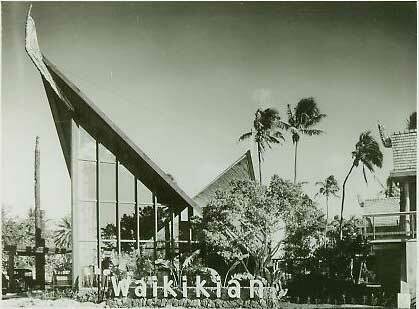 The Waikikian Hotel circa 1956-60 designed by George J. "Pete" Wimberly and the architectural firm of Wimberly Allison Tong & Goo. 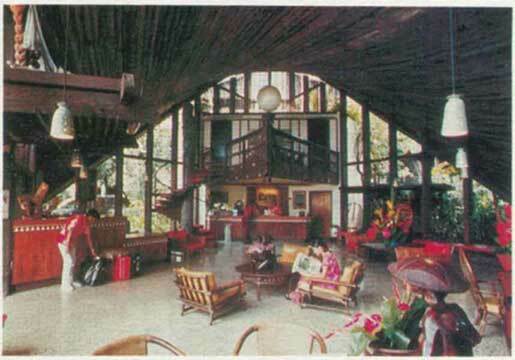 An unsung hero in faux Polynesian hotel and restaurant design. 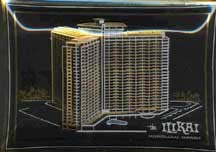 On December of 1996 The Wakikian, Hawaii’s last “Tiki Style” hotel closed its doors for the last time, due to renovations costs and a slowing economy. 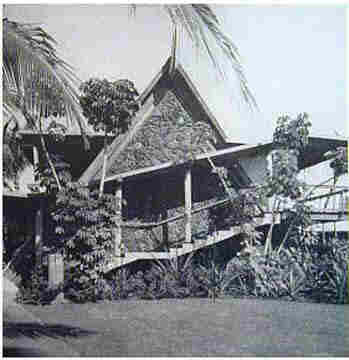 The timing couldn’t have been any worse since the tiki culture was beginning a national resurgence that continues to this day. I was fortunate enough to enjoy this place until the end and before the wrecking ball hit had the foresight to create a small photo archive of the place. 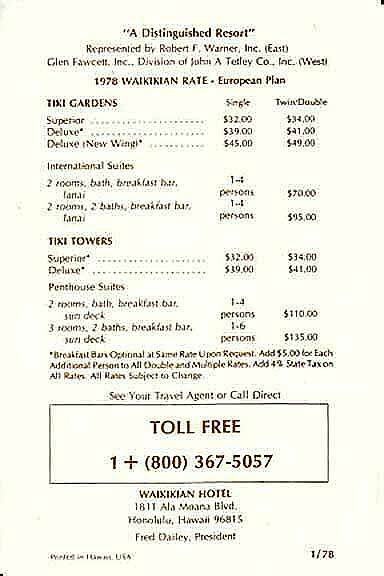 The following month after its closing there was an auction at the connecting tiki bar (The Tahitian Lanai) that permitted me to add a few of the faux Polynesian artifacts from that bar and hotel to my collection. So with the magic of the internet and a Photoshop program to help restore a few of these out of focus snapshots I’ve decided to share a small tour of this gone but not forgotten landmark. So put on an Aloha shirt, grab a Blue Hawaii and lets go. 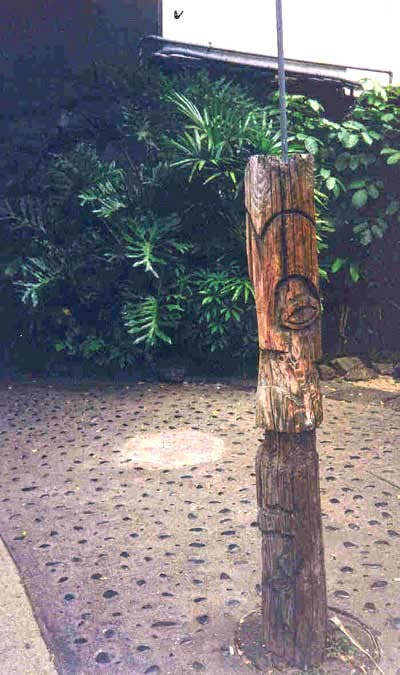 This is the entrance of the place that could be interchangeable for most local hotels but if you look closely to the left of the picture and follow the utility pole to the ground you might make out a small tiki that is carved into the wooden brace on the cable to the sidewalk. To my knowledge this fixture is still there amusing tourists and people waiting at the bus stop. This hotel had a small low rise that you can see to the left that was that showed its age (charm). 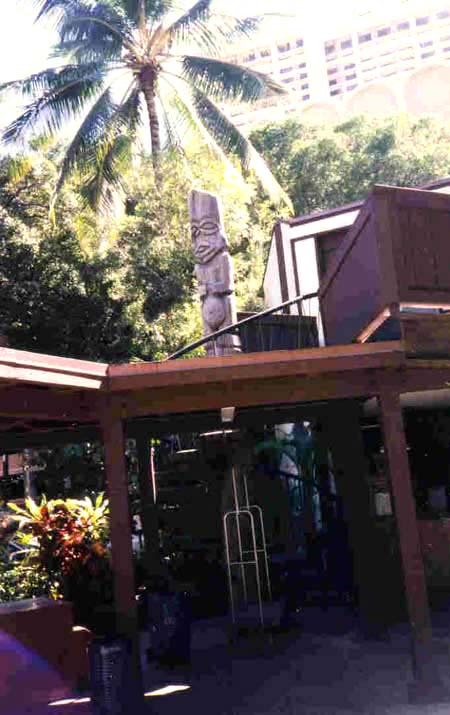 The inside had a more of a dorm like appearance rather than hotel and instead of doorknobs you locked yourself out with a deadbolt lock..
A closer look at the entrance lobby, where a watchful tiki ponders. 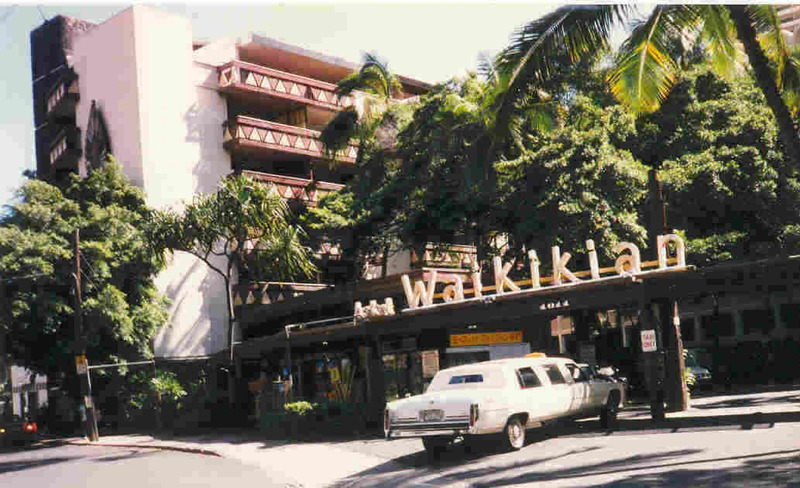 A side note is the large hotel in the background is the Ilikai where Arthur Lyman use to play at the Canoe House in its hey day. Followers of the TV show Hawaii 5-0 might recognize this place as where Steve Magarrett was introduced during the credits standing on a balcony. 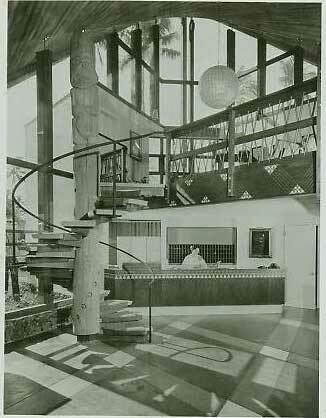 This tiki use to adorn the lobby with a similar one. Shown here up for auction went for a mere $300. I lived in a shack back then and that would have never fit through the door. Fun fact - this tiki is cast from a resin mold and the tiki color is achieved with brown leaves in the mix. This was the sign that pointed the way the lobby gift shop, not sure what treasures it held but I have seen Waikikian beach bags and key chains. The shop was long gone last time I was there but the former ABC store behind the tiki utility pole wasn't a bad substitute for tacky tiki keepsakes..